Do you love gazing at tigers with bare eyes? Do you seek adventure on your wildlife trip? Do you wish to scout the majestic flora and fauna combined with picturesque sights that will take your breath away? Take out some time from your busy schedules for the celebrated and majestic Corbett national park nestled in the lap of Himalayas in the beautiful state of Uttarakhand. The Park was set up in 1936 as Hailey National Park, but later got changed into Jim Corbett National Park in respect to the famous hunter-turned environmentalist –Jim Corbett, who made great efforts in its foundation. It is certainly a great example of ecological units with copious varieties of foliage and creatures. Every year more than 70,000 tourists from India as well as foreign countries visit here to scout its unique exquisiteness and a huge array of wild species that bestow calming effect to the eyes. The park renders a natural habitat to a great range of floral attractions. As the travelers put their feet into the park, the flowers spread out its magic with the most unparalleled exquisiteness. The Sheesam, Chir pine the Ber, Jhingan, Dhak, Janum, Oak and a lot more are seen in the Jim Corbett National Park. Known for its great population of tigers universally, the park is a home to 50 species of mammals, 25 sorts of reptiles and more than 580 genres of birds. Some of the animals that are found in heaps are wild cheetah, elephants, jungle cats, sloth bear and rhesus monkeys. Once you are in Jim Corbett, it would be a pity to leave it without relishing the exciting elephant, jeep or canter safari. These will be a pleasure and enchantment for your memoirs .The perfect way to feel the deep forest is through elephant safari which takes you through the core areas and let you encounter different wildlife animals from a close distance. If you crave to have memorable memories forever and you are audacious enough, then don’t miss getting either on a jeep or elephant safari. One must plan his/her tour to Jim Corbett National Park between November and June as during this time most of the gates of Corbett remain open for the travelers, who come in search of exploring the unknown things and nobility of Jim Corbett and its ambiance. The climate in Corbett is moderate in comparison with other cosseted areas of India. The temperature during summers varies from 200 C to 400C, while in winter remains cold and pleasant with the temperature of 50 to 300C. 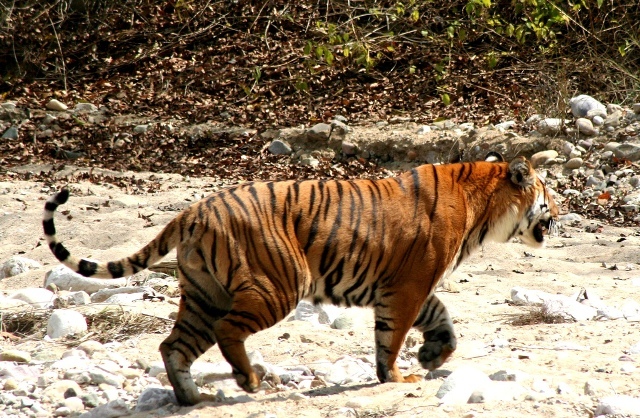 What things you must bear in mind before setting out for Corbett National Park? – Try to book your favorite safari in advance to enjoy last minute hassle. – Carry your necessary items like sunscreen, medicines along with you as you can’t expect any of them in wildlife habitat. – Don’t forget to keep a camera in your luggage as this will make your tour remarkable. – Avoid wearing bright clothes during your tour in Corbett. – Don’t smoke inside the park. – Maintain a distance from wild creatures. – Don’t throw waste stuffs in the premises of the park.